Read a Clinique perfume review. Clinique Makeup products have been a department store mainstay for decades. Founded in 1968 as a branch of the Estee Lauder Company, Clinique's distinctive brand of skin-care, sold by consultants in the unmistakable white lab coats, is now carried in over 130 countries and is currently the top selling prestige makeup line in the United States. Clinique represents one of the oldest and most trusted brands within the cosmetic industry and there are many factors in Clinique's composition that distinguish this label from other cosmetic lines and help to maintain a consistent and loyal consumer base. Clinique isn't just a cosmetic line. The brand was originally founded upon deep dermatological concerns. Many cosmetic lines are loaded with fragrances and potentially allergenic ingredients, making them unusable by persons with sensitive or reactive skin. Clinique honed in on such issues and was established to eliminate these dermatological concerns. Buyers are assured that every Clinique product is entirely fragrance-free and allergy-tested. Allergy-tested or hypoallergenic claims cannot guarantee that a user will not experience a reaction. Such claims do, however, ensure consumers that each product has been tested and crafted to eliminate certain allergens or ingredients that may cause sensitivity. This means that users are far less likely to experience any symptoms when using Clinique products than they would by using those of other brands. Unfortunately, due to the unique biochemistry of every individual, it is impossible for any cosmetic company to guarantee that no reaction will occur. Clinique makeup stands out from the crowd because of its gentle composition. Most of Clinique's eye makeup and mascara products are tested by an ophthalmologist to ensure that they are safe for women who wear contacts or have sensitive eyes. The Lash Doubling Mascara goes on quickly while amplifying eyelashes for women who want thicker lashes, and is a perfect compliment to Quickliner, the automatic eyeliner pencil available in fifteen colors. Clinique also offers over a dozen types of lipstick. But rather than just making one look pretty, these products have a task to perform--many contain sunscreen or extra moisturizers for dry lips. As is true of most cosmetic lines, Clinique's products continue to evolve and expand with each new seasonal collection, though the line is maintained by a large stock of lasting customer favorites. The company palette comes in a wealth of shades and somewhat long lasting formulas. However, when judged against lines such as Dior, Chanel, or Givenchy, Clinique's colors may literally pale in comparison; Clinique's pigmentation is typically lighter. Still, the company's simple packaging and basic features keep this line selling at nearly half the price of the aforementioned luxury lines. 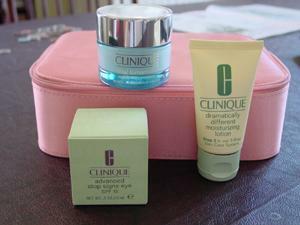 Within the Clinique cosmetic line there are many notable products that have launched this label as a household name. Moreover, this skin care program is sold in four formulas depending on your skin type. Normal, combination, oily, dry and mature skin formulas are all available along with newer specialty products that are formulated for sensitive skin. The line's Dramatically Different Moisturizing Lotion has been a top-seller through the decades. Clinique's Turnaround line is one of the most popular skin renewal lines on the market. It began with the introduction of the Turnaround cream, an anti-aging product rich in beta hydroxy acids to exfoliate the skin and create a radiant glow. This line has now expanded into a multitude of serums, creams, and products that use the same beta hydroxy acid base. Clinique manufactures one of the most natural and non-irritating mascara formulas that became an instant favorite of those who love fuss-free makeup. No flakes, no smears, no clumping, and nothing but a faint natural looking coat for the lashes is the promise of this simple formula. For individuals who are tired of raccoon eyes and are looking for a simple daytime formula, Clinique's Naturally Glossy Mascara lives up to its claims. 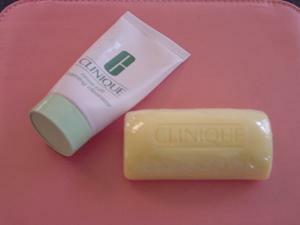 Clinique's Chubby Sticks are a more recent product with an already large following. These ultra-moisturizing balms are infused with mango and shea butter. Chubby Sticks come in a thick almost crayon-like applicator and are currently available in eight shades. 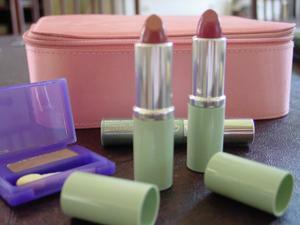 Colors are lightweight, natural, and provide the lips with a frisky just-bitten look. Fragrances continue to be big sellers for the cosmetic giant. Clinique's popular Happy fragrance is an extremely sought-after product. In 2009 it won a Glamour Magazine Reader's Choice Award. This light floral and citrusy scent is unassuming, feminine, but also memorable, and remains one Clinique's most highly reviewed items. Happy's popularity has spawned other offers in the same series with Happy Heart, Happy to Be, and Happy in Bloom, each featuring a different balance of softer scents. The company also developed a Happy for Men, which comes in a cologne and after shave balm. Clinique bonuses are almost always available in at least one Clinique retailer. For a minimum purchase fee, consumers will receive a Clinique makeup case filled with either introductory products or all-time favorite top-sellers. Clinique makeup is no longer just for women who want to pamper themselves: men can enjoy the same benefits with skin care products developed specifically for their skin. Body washes, eye moisturizers, and face lotions aggressively work on men's tough skin while getting in deep to clean out pores. Of course, to still any fears men may have about using "makeup," the smart folks at Clinique package it all in stylish black and grey bottles to avoid any confusion with their more feminine products. They also offer a complete line of shaving products and skin cologne. Moreover, each Clinique product is consumer reviewed at the official Clinique website. You can check for retailers online on the store locator. Clinique also features an online store. Be aware that Clinique products are not intended for resale, and items sold outside authorized retailers are not of legal distribution.